Indigo is one of the world's most unusual and breathtaking dyes, and it has fascinated and frustrated artisans since its discovery. No two batches are quite alike, and on top of that, it fades, just like your favourite pair of jeans. Yet this unpredictability is what makes indigo dye unique and beautiful, and now knitters and crocheters are discovering the exciting design possibilities of working with indigo yarn. 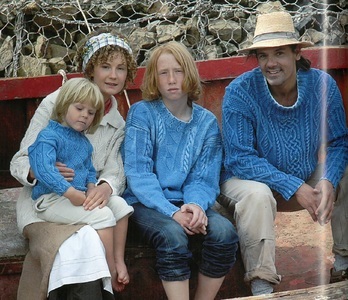 Jane and Patrick Gottelier, founders of the Artwork knitwear line, are the designers who first discovered and developed the fashion potential of indigo yarn. 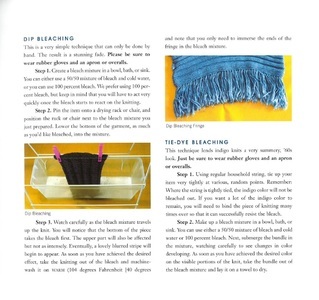 Here Jane reveals their trade secrets for working with indigo-dyed yarns, sharing the denim knit and crochet patterns and techniques that have made the Artwork famous. Organised according to various locales in Cornwall, England - from the fishing hub of Newlyn to the bustling town of Penzance - Indigo Knits offers more than 25 original patterns that capture the brilliant hues and equally colourful history of Cornwall. Whether it's a Cornish Knit Frock, a Pirate-striped Guernsey, or an Artist's waistcoat, there are denim designs for everyone. There's also a secret on washing, fading, distressing, and producing unique finishes on indigo knits, so that you can truly get to know this mercurial yarn.